As a steam punk aficionado I sometimes think I could be happy living with Victorian technology if I could just escape Victorian values and social conventions. Except for two areas: public sanitation and medicine. This podcast is about a small inorganic, or perhaps I should say organometallic, molecule that has had some impact on both fields: ferrocene. It is unclear when ferrocene was first made, but it seems to have been recorded as a ‘yellow sludge’ in the late 1940s by process technicians inspecting pipes at a Union Carbide cracker, which was used in the manufacturing of the small hydrocarbon cyclopentadiene from dicyclopentadiene. Its first report in the literature, however, was by two different groups in December 1951 and February 1952. It caused quite a stir, since no stable molecule composed of only a hydrocarbon and a transition metal were known before, and this compound could be kept in air at room temperature without spontaneously igniting. It also survived meeting such notorious killers of organometallic molecules as water, acids or bases. When, a few months later, it became clear what this unusual compound looked like, it must have been like meeting a giraffe for the first time when you’re used only to sheep, cows and horses. 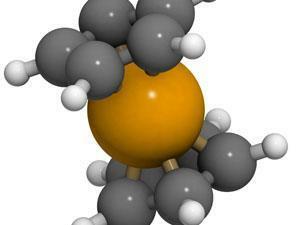 Nobody had ever seen a molecule like this before. Ferrocene was the first example of the now very large class of compounds unceremoniously known as sandwich compounds, and more formally as metallocenes. They share not the triangular shape of the classic English sandwich, but the characteristic of squeezing something between two flat objects, namely a metal ion, in the case of ferrocene the iron 2+ ion. The two flat objects are cyclopentadienyl ions, each with a single negative charge. These are not triangular, but shaped like regular pentagons, making a molecule of unusual symmetric beauty. Ferrocene owes its unusual stability to the fact that when one proton is removed from the cyclopentadiene molecule, C5H6, it becomes the flat and aromatic cyclopentadienyl ion, C5H5–. This means that apart from the ten electrons holding the ring together in five single carbon–carbon bonds, it has six extra electrons whooshing around above and below the pentagon. This is exactly the same situation as in the benzene molecule, the hexagonal C6H6, and the same explanation for its stability holds, partly due to the symmetric beauty I mentioned before. The similarity to benzene made chemists adopt the name ferrocene. Apart form the intrinsic beauty of an object we cannot see, is it good for anything you may ask. And the answer is yes; both the particular ferrocene molecule and the whole class of sandwich compounds have practical applications. Perhaps not so surprisingly metallocene compounds can make good catalysts, for example to help making things like polyethylene and polypropylene. Of which, among other things, you can make good quality tubes that are vital parts in keeping a large city safe from the infectious diseases that plagued Victorian times. Less obvious is that sufferers from diabetes often use this molecule several times a day. It is not a replacement for the small protein insulin, but instead a vital part of the small electronic devices that measure blood sugar levels. These devices use exactly the same enzyme that oxidises glucose in the body, glucose oxidase, but immobilised in a solution. When one glucose molecule has been oxidised, the enzyme has taken up two electrons from the glucose and it needs to get rid of them before it can take on anther glucose molecule. The device does this with two ferrocenium cations, which is a ferrocene molecule stripped of one electron and now containing Fe3+ instead of Fe2+. So for every glucose molecule in the blood sample, to re-oxidise the enzyme, two ferrocenium cations are turned into ferrocene..To regenerate the original ferrocenium cation, the device passes an electric current between two electrodes, electrolyzing the ferrocene. The device measures this current, and converts it to micromoles of glucose per litre on the display. Not bad for a tiny sandwich! Not bad indeed. That was Lars Öhrström from the Chalmers Tekniska Högskola in Sweden with the chemistry of ferrocene, a compound appreciated, no doubt, by diabetics worldwide. Next week, the origins of superconductivity. YBCO is a superconductor at relatively high temperatures. By ‘relatively high’, I mean around 93 Kelvin, which is still pretty chilly. But most materials that superconduct – that transfer electricity without resistance – can only do so at even lower temperatures. This meant that the phenomenon was only discovered once scientists could access very low temperatures through liquefied gases. In 1908, Dutch physicist Heike Kamerlingh Onnes managed to liquefy helium, the most volatile element of all. This allowed him to cool other things down to just a few Kelvin – around –270 degrees Celsius. Onnes had the whole field of low-temperature cryogenics open to him. And discover how this open access led to the discovery of yttrium barium copper oxide, or YBCO, by joining Neil Withers in next week’s Chemistry in its Element. Until then, thank you for listening, I’m Meera Senthilingam.